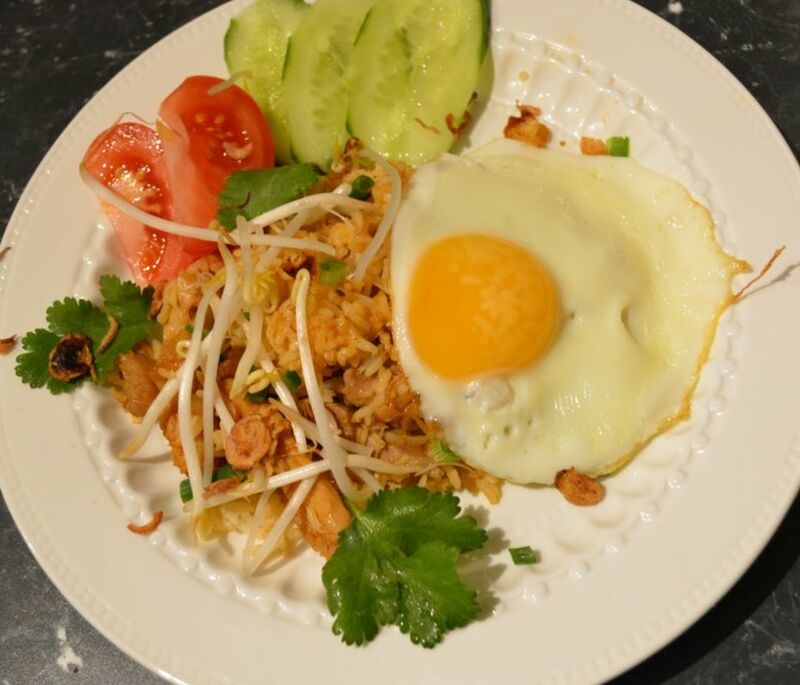 My family love this, they call it fried rice with eggs, which is fine as in Indonesian Nasi Goreng literally translates as fried rice. It is packed full of flavour and a great mid week meal as it is quick to make. Now the recipe is in a 20 minute cookbook, it probably takes me 30, as I generally don't rush too much. As the sauce for me was overpowering in the original recipe I have done two things to fix that problem. One, to serve 4, I have halved the soy sauce and sugar quantities from the original recipe as I found it didn't need it. But if you want you can mix together an additional 1/4 cup of light soy sauce and 1/4 cup brown sugar and use it as a sauce that you put on the table for anyone that wants to add extra. Two, to feed more (as there is 5 of us), keep the soy sauce at 1/2 cup and the sugar at 1/2 cup which was in the original recipe, but increase the rice to 3 cups. Plus fry an additional egg, serve extra crispy fried shallots and additional fresh shallots. By doing this the flavours are more subtle, not so intense. My family love it with a lighter soy flavour. Shrimp paste and crispy fried shallots can be found in the Asian section of large supermarkets or Asian grocery stores. Shrimp paste although smells absolutely horrible raw, once cooked adds an amazing flavour to this dish. ​So need a new mid week meal idea, look no further, this is delicious. Put the rice into a rice cooker with the amount of water the rice cooker recommends and cook. Once cooked, keep it in the rice cooker on warm mode, until needed. Combine the soy sauce and the brown sugar in a bowl, stir until the sugar has dissolved. I like to use a wok, as there is less mess (but you can use a chef pan). Put the wok over high heat, add 1/2 of the oil. Add the chicken strips. Cook stirring, for 3 minutes. Add the onion and garlic, cook, stirring for a further 2-3 minutes or until the onion starts to soften. Add the shrimp paste and stir through, cooking for a further minute, until the chicken is cooked through. Add the soy sauce mixture and the chilli sauce to the chicken. Add the cooked rice and stir to mix thoroughly. Turn off the heat while you cook the eggs. Heat a frying pan over medium-high heat and add the remaining oil. Fry the eggs sunny side up. Divide the rice among 4 plates and top with equal amounts of the crispy shallots, shallots, chilli and peanuts. 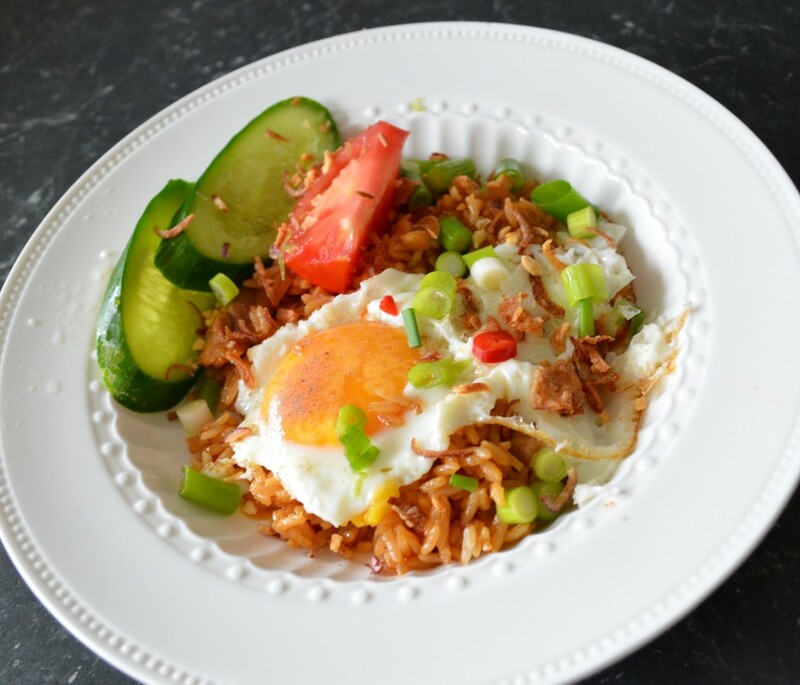 Place one egg on top of each plate and serve the cucumber and tomato beside the rice.